Blood flow through the skin is variable depending upon the body temperature regulation (flow ranges from 1 ml to 150 ml/100 gm/min.). The cutaneous blood vessels show anastomoses between arterioles and venules (arteriovenous anastomoses) particularly in the fingers, palms, ear lobes, face, and feet. The capillaries in the skin are closed most of the times and become patent, when the body temperature rises. The cutaneous blood vessels are directly influenced by the rise in temperature, which causes vasodilatation. The increased blood flow, occurring as a consequence to this, helps to dissipate the heat and bring down the body temperature. When body is exposed to cold environment, the hypothermia directly acts on the cutaneous blood vessels and produces vasoconstriction. The reduction of blood flow to the skin helps to conserve body heat and maintain body temperature. Skin arteries and arterioles are supplied by sympathetic noradrenergic fibers, which cause vasoconstriction. This action is seen in hypothermia and circulatory shock. The profound vasoconstriction of the skin in hypovolemic shock, produces cold skin. There are also metabolites like bradykinin, substance P, histamine, etc released in the skin which have effect on the arterioles and capillaries of the skin. Bradykinin and histamine cause vasodilatation and increase in skin blood flow. 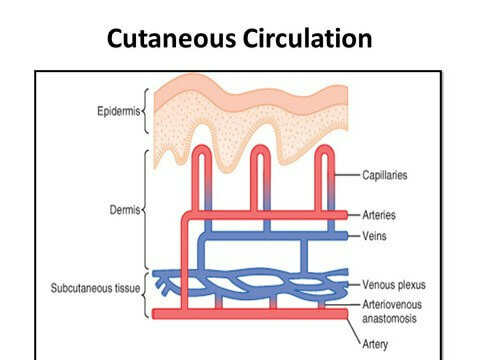 Cutaneous circulation shows responses to injury or trauma. These vascular responses are grouped under triple response. The direct mechanical stimulation of the capillaries of the skin by a blunt object, produces dilatation which gives red line called red reaction. A little later, redness of the skin spreads to the surrounding area, which is due to the dilatation of arteriole caused by the axon reflex and called as flare. It is the only reflex, not mediated through the central nervous system. The impulses travel antidromically in a branch of sensory nerve and dilatation of arteriole is produced by the release of substance P or histamine at the nerve ending. After some time, there will be developement of edema in this region, caused by the release of substance P or histamine, which increases the capillary permeability. This response is known as wheal. The regional circulation shows a regulatory mechanism called reactive hyperemia, which can be seen in coronary, skeletal muscle and cutaneous circulations. It is the mechanism which shows increased blood flow after a period of occlusion of the artery. The metabolites like CO2, H+, K+, lactic acid, etc, accumulate in the interstitial fluid surrounding the arterioles and capillaries during the occlusion period. The vasodilatation produced by them increases the blood flow, when the occlusion on the blood vessel is removed. This phenomenon is called reactive hyperemia.